F.C. Chandler in Cleveland, Ohio founded the Cleveland Automobile Co. in February of 1919. Chandler had already organized the Chandler Motor Car Company in January of 1913. The Cleveland was to be produced as a lower-priced companion automobile to the already successful Chandler. Fisher Brothers built the Cleveland body before they built bodies exclusively for GM after becoming a division of General Motors in 1926. As was common for that era, only two colors were available, coach blue and devil blue, with gold edged black stripes. Interiors were appointed in black leather. The photo above is a 1924 Cleveland. Chandler Motor Car Company built more cars than any other car manufacturer in Cleveland in 1920 but sales declined for both the Chandler and Cleveland automobiles in1921 and the two companies consolidated as Chandler-Cleveland Motors Corp. In 1926 the Cleveland name was discontinued and the company continued to build only the Chandler. In December of 1928 the company was sold to the Hupp Motor Car Corp. of Detroit, who purchased the company strictly for the facilities to increase production of the Huppmobile. In 1929, as part of General Motors’ companion make program, Oldsmobile introduced the higher standard Viking brand, marketed through the Oldsmobile dealers network. Men were hired to walk the streets in “Viking” outfits to advertise the brand. The price point would place the Viking between Oldsmobile and Buick, but it seems the bulk of the buyers were being taken from the Oldsmobile line. Viking was discontinued already at the end of the 1930 model year after a total production run of 7,224 over three model years. 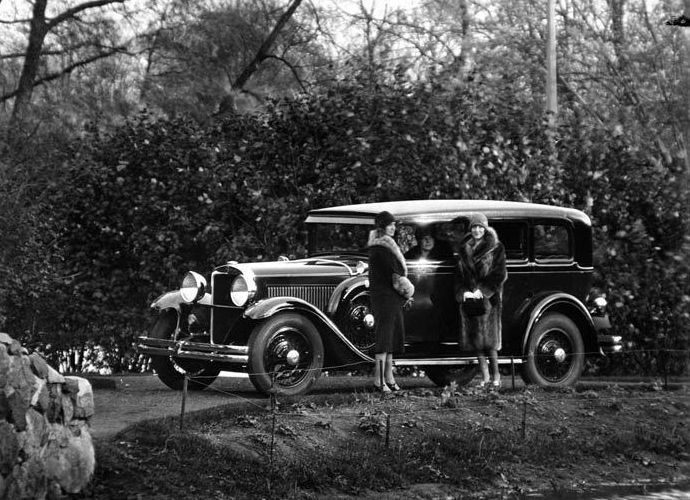 An additional 353 cars were marketed as 1931 models. There was a Pontiac automobile produced by the Pontiac buggy company in Pontiac Michigan that pre-dates GM and the Oakland automobiles later produced by the same company. You will be able to read more about that car in the 1929 Orphan Vehicles section of this website. The first Pontiac introduced by General Motors was the companion marquee to GM’s Oakland division, in 1926. 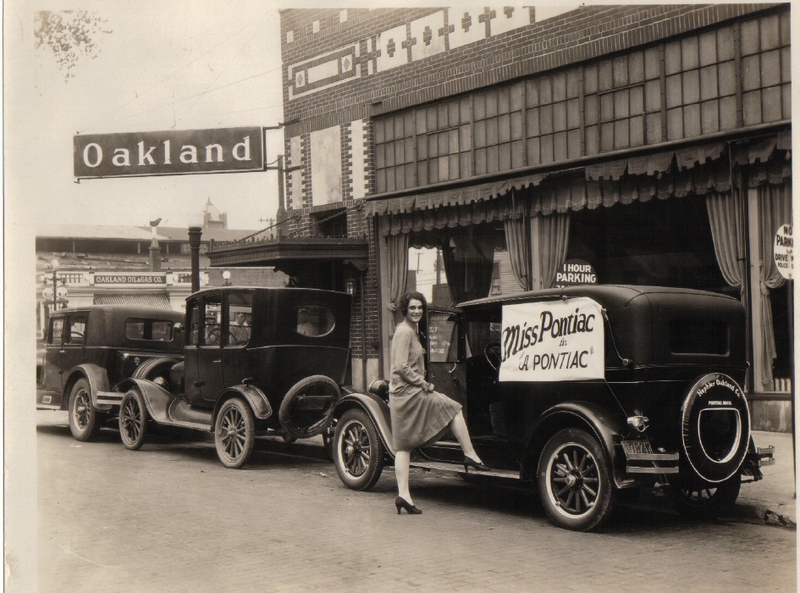 Pontiac became the only companion marquee to survive its parent, with Oakland ceasing production in 1932. Pontiac was introduced to fill the price gap between Chevrolet and Oldsmobile. In addition, the new Pontiac would serve as a platform for Alfred P. Sloan’s new idea of interchangeable parts, sharing vehicle components in an effort to improve efficiency. 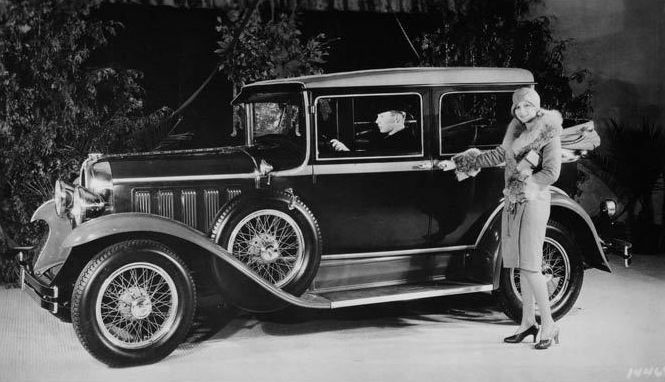 The 1926 Pontiac featured two closed models, a coupe and a sedan with a Fisher-designed body. The six-cylinder L-head engine, could achieved maximum speeds of 50 mph. Priced at $825, Pontiac sold 76,742 cars in its first year on the market. As demand outpaced capacity in 1926, the division began plans to build a $15 million assembly plant in Pontiac, Michigan. The new Pontiac factory was the largest construction project in the U.S. that year. The factory became known as the “daylight” plant because it used so much glass. The unique architecture attracted visitors from around the world. Below is a photograph of “Miss Pontiac” taken outside of a local Oakland Pontiac dealership. In 1927, the Art & Colour department, the industry’s first formal design studio led by Harley Earl, took over design of all GM models, including Pontiac. Calendar year production grew to 127,883 cars in 1927. 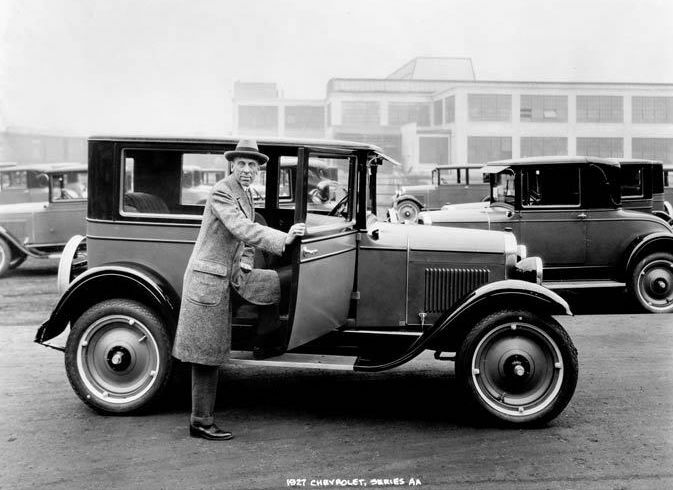 In late 1927, Pontiac unveiled the Series 6-28, its first major model change. The company added a third assembly line at the daylight plant. The model 6-28 introduced a new cross-flow radiator, that would become the industry standard. Pontiac sold nearly 184,000 model 6-28s. Pontiac introduced the famous Indian head in silhouette emblem, which remained the Pontiac logo for three decades. 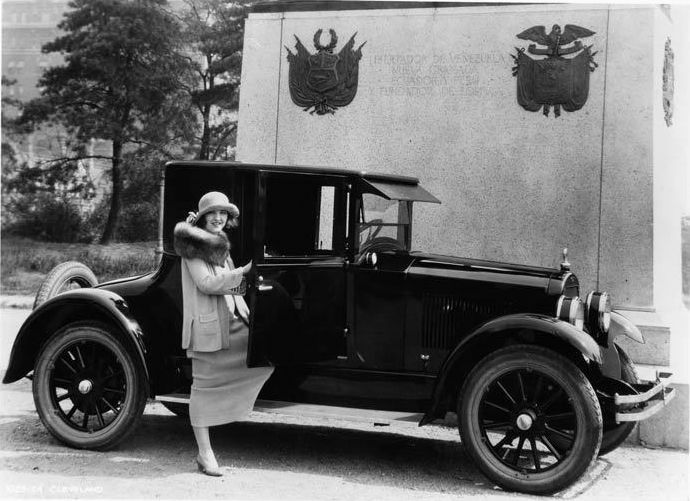 In the twenties, most vehicles did not have a badge with the name of the vehicle on it. They relied heavily on mascots, such as my Pontiac’s famous Indian Head radiator cap. The radiator cap and the brass Fisher Body tag are the only identification on my Pontiac. 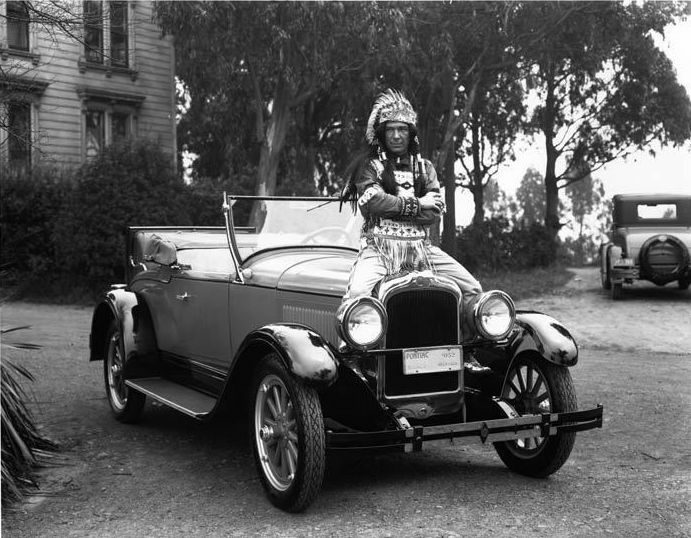 Below is a factory promotional photograph of the 1927 Pontiac with an Indian sitting on the hood as if it were a horse. 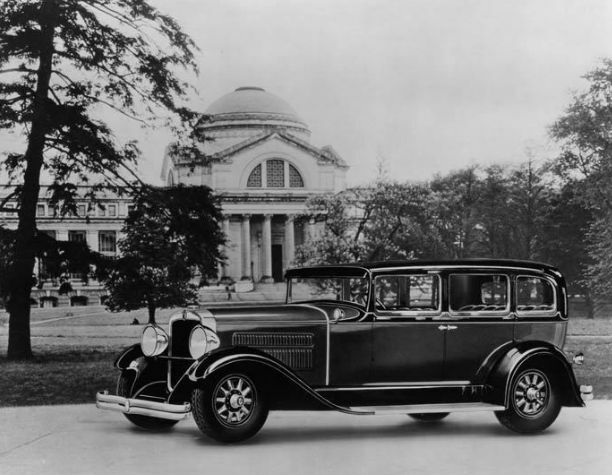 In 1929 Pontiac introduced the Series 6-29 Big Six, and built its 500,000th car. Closed bodies were built by Fisher Body, and open bodies were built by Stewart Body. The 1929 Pontiac had three changes for that model year. 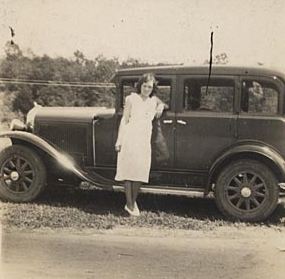 The first 1929 Pontiac model was introduced in August of 1928, the Model 6-28 which introduced new chassis and mechanical features, but used the 1928 body. The artillery wood wheels went from 12 spoke to a stronger 10-spoke design. The Marvel Carburetor replaced the Carter unit, and several other mechanical changes were made to the drive train. 224,784 of the Model 6-28 were built before introducing the model 6-29A in November of 1928. This was a significant body change. The belt line now swept down at the point of the windshield. The radiator had a vertical chrome bar added down the middle of it, creating the trademark split grille design the company would become famous for. Adding horizontal louvers, which were changed back to the vertical vents after only a few months, emphasized the length of the hood. The rumor was that the horizontal vents were warping. Many car manufacturers used the horizontal vents during that time, so I don’t know if that rumor is true, or if it was some other reason that influenced the decision. This new change in the hood louvers became the Model 6-29B, the model I own. The displacement of the engine was increased to 200.4 CID and horsepower was raised from 48 to 60. This is a split head in line six. Pontiacs were painted certain colors, according to body style until June of 1929. Starting in June, the full range of colors was available to any customer regardless of what body style was selected. The original color scheme of my Pontiac was Seminole Blue body and wheels, Powhatan Blue window reveals, Black fenders, with Tacoma Cream pinstripes. The interior was blue velour. At some point in the past, someone painted the entire vehicle black. They even painted over some of the chrome parts, which ended up preserving them. I will refinish this Pontiac in the original color scheme. 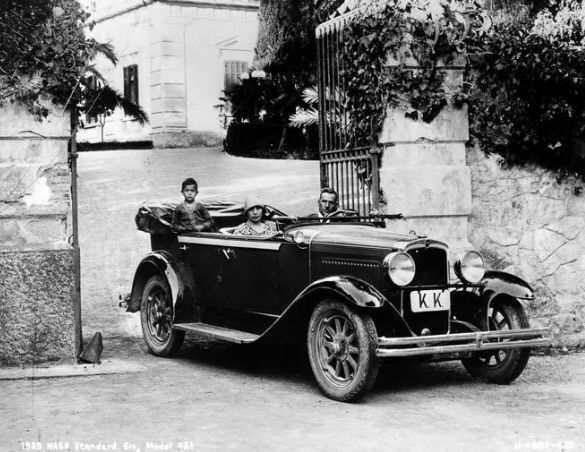 The only change in the 1930 Model 6-29A was the Convertible Cabriolet, and Landaulet Sedan was now discontinued. The 1930 Model 6-30B (There was not a Model 6-30A) saw body changes, with the belt line that swept down at the windshield for the previous model, now continued to the front of the car. In 1893, Edward M. Murphy established the Pontiac Buggy Company in Pontiac, Michigan. The company produced horse-drawn carriages until 1907, when Murphy started the Oakland Motor Car Company because it became clear that motor car sales were going to eclipse carriages. 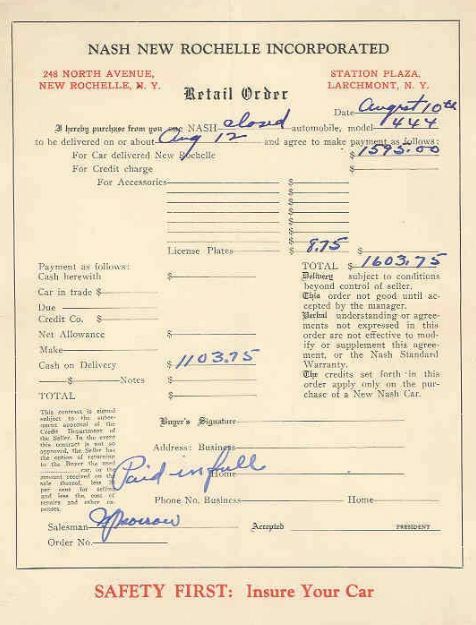 Five models were offered the first year with prices ranging from $1,300 for the Model A runabout to $2,150 for the Model E four passenger landaulet. First year production was 278 cars. In January of 1909 General Motors President William C. Durant purchased a 50% interest in the Oakland Motor Car Company. Later that year GM bought out the other 50% after the unexpected death of Edward M. Murphy at the age of 45. 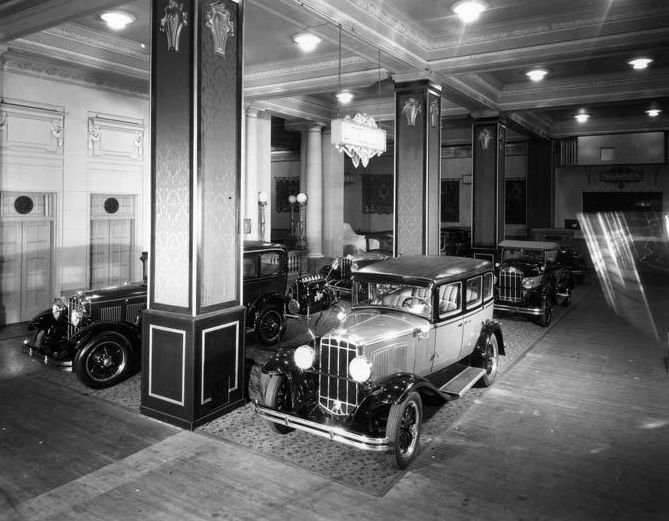 The Oakland Motor Car Company officially became a division of General Motors and sales dramatically increased to 1,035 cars. General Motors President, Alfred P. Sloan, pioneered the idea that consumers would aspire to buy up an automotive product ladder if a company met certain price points. A sizable price gap had existed between Chevrolet and Oakland–Oldsmobile and Buick, and between Buick and Cadillac. General Motors introduced four companion marquees priced and designed to fill these gaps. This is often referred to as General Motors Companion Make Program. Oakland’s part in this plan was the 1926 Pontiac, a shorter wheelbase “light six” priced to sell at a 4 cylinder car’s price point. Introduction of Pontiac was enthusiastically accepted with 49,875 cars being registered in the first year of production. Pontiac was the first of the companion marquees introduced, and in its first year outsold the larger, heavier Oakland. 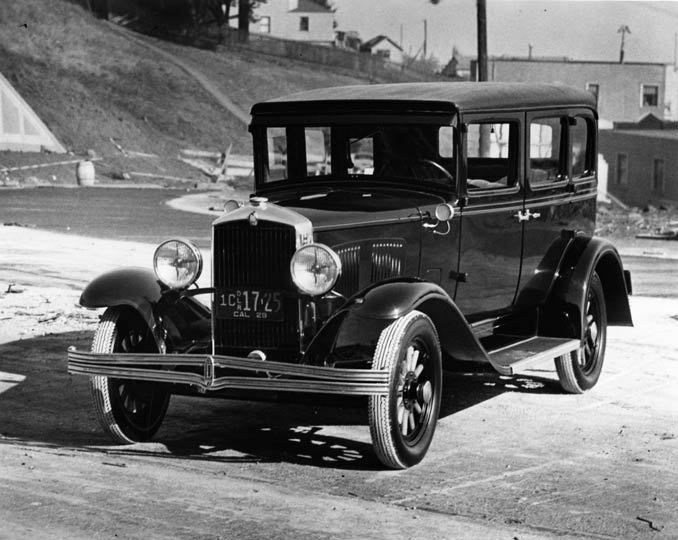 By 1929, GM sold 163,000+ more Pontiacs than Oaklands. The discontinuation of Oakland was announced in 1931 and the Pontiac would be the only one of General Motors’ companion makes to survive its “parent” make. 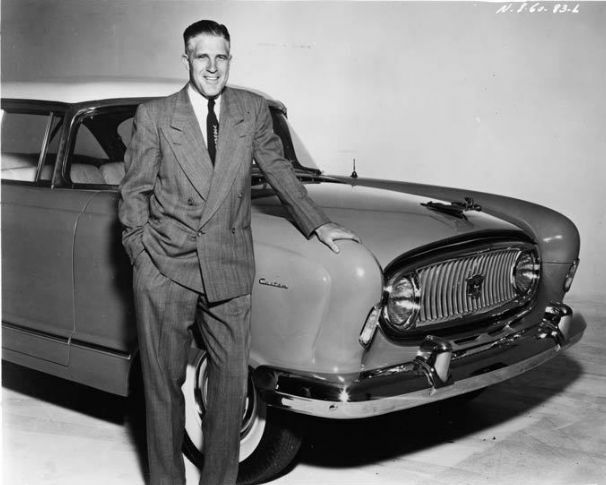 Nash Motors was founded in Kenosha, Wisconsin in 1916 by former General Motors president Charles W. Nash who acquired the Thomas B. Jeffery Company, who built the first Rambler in 1902. The Nash slogan from the late 1920s and 1930s was “Give the customer more than he has paid for.” By 1928, Nash was experiencing record sales for the company and in 1932 only Nash and General Motors were able to show a profit. 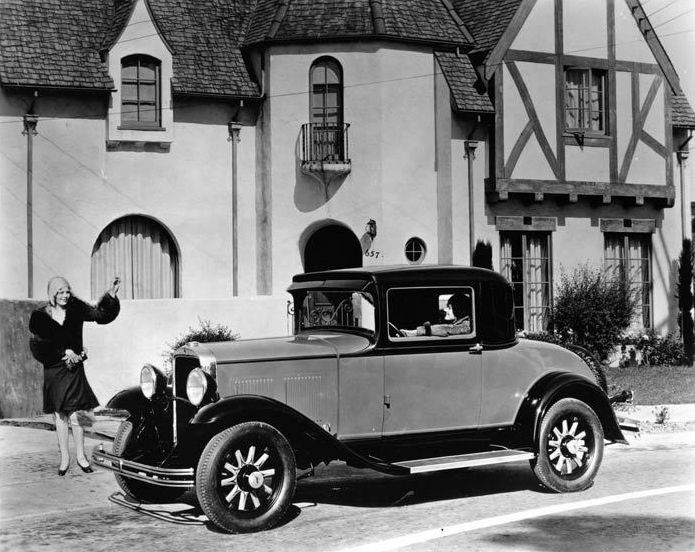 Production for the 1929 model year totaled 116,621 units priced around $1,500.00. 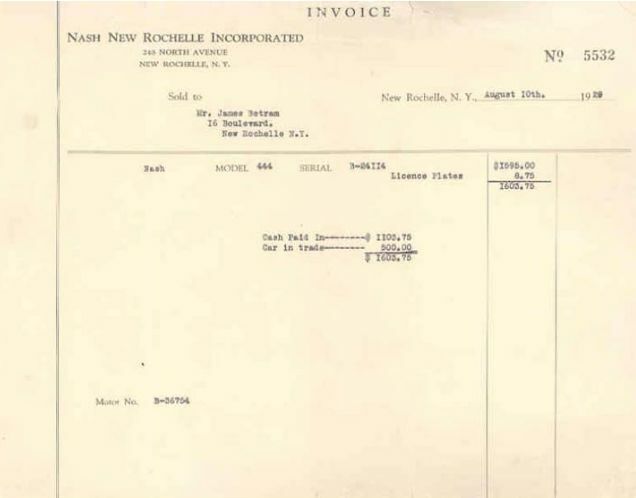 Below is the 1929 Nash model 444 and I have included the sales paperwork for the purchase of such vehicle. The buyer got $500.00 for his trade. In 1954 it was decided if they wanted to survive, Nash and Hudson would best compete with General Motors, Ford, and Chrysler if they joined forces. Nash and Hudson merged to form American Motors with George Romney at the helm. (Yes that is Mit Romney’s dad.) Below I have included a photo of George Romney with a 1959 Rambler. Just as Cadillac was named for a French explorer, Lasalle was named for the French explorer of the Great Lakes region, René-Robert Cavelier, Sieur de La Salle. 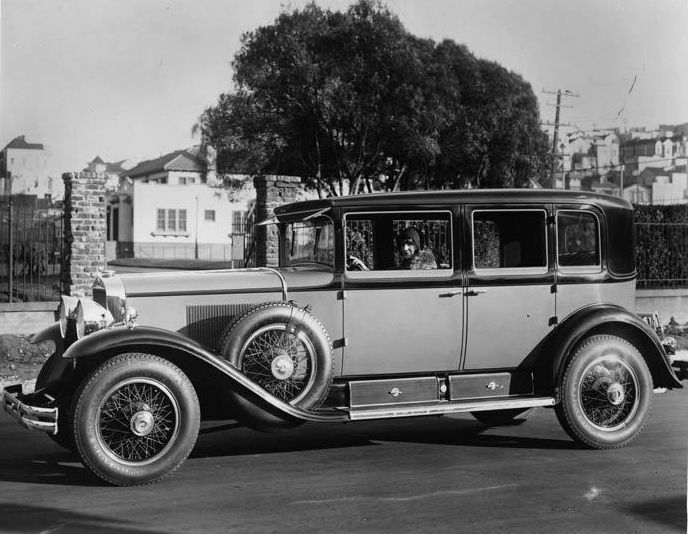 Cadillac dominated the U.S. luxury-car market in the Teens and early Twenties, but by 1925, Packard replaced Cadillac as America’s most popular premium automobile. Packard management had been shrewd enough to sense the need for a high-quality automobile that offered traditional Packard quality at a substantial cost savings. Packard was taking sales from GM in the luxury car market. General Motors president Alfred P. Sloan, had the slogan, “A Car for Every Purse and Purpose.” The idea was that buyers would buy larger, more luxurious, and more expensive automobiles in the General Motors family as their fortunes improved. A wide price gap separated the top-of-the-line Buick, at $1925, and the bottom-end Cadillac, selling at $3195. For buyers that reached the point where they could afford something a little more elegant than a Buick, this was a big financial leap. Auto financial contracts were generally only 18 months in those days, and many people felt payments on a Cadillac were more than they could handle. GM found the more affluent Buick customers were often defecting to Packard’s new lower-price offerings. The Oakland division of GM introduced the companion make named Pontiac in 1926. The immediate high success of Pontiac suggested the solution for the lost sales to Packard was another new companion make for Cadillac. Lasalle was introduced as the answer to keep those Packard customers in the GM family. Formally introduced on March 5, 1927, the LaSalle was priced at $2685 for the base four-door sedan, exactly $100 higher than the equivalent Packard. 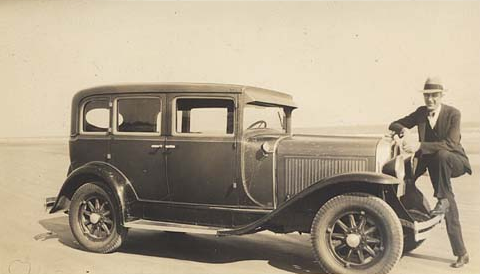 In 1929 a departure from the original LaSalle concept came as the long-wheelbase models had become very popular. Some thought this larger size robbed the car of its charm, but sales sharply increased while Cadillac demand fell by more than half. The conclusion was the larger LaSalle was stealing sales from Cadillac, not Packard. For 1929 the Lasalle sold for $2450 and built 22,961 units. The Lasalle revolutionized the course of the entire industry with regard to styling, and marketing strategy. Sloan hired a talented young man named Harley Earl to head up a new GM department called the Art & Colour Section, the industry’s first in-house styling operation. Earl used modeling clay to evolve the forms he had in mind, a material then considered highly unusual for this purpose. Earl would remain with General Motors as the company’s director of design for 32 years. Chevrolet has a very rich heritage, I could write a book about this make by itself. William Durant was forced out of GM in 1910 because the board of directors thought his expansion plans were too reckless. Durant had hired Louis Chevrolet to drive Buicks in promotional races for GM. but in 1911 Louis Chevrolet and William C. Durant would co-found Chevrolet. The Chevrolet was very successful, and within two years it was being sold in other countries, and very profitable. Chevrolet was profitable enough to allow Durant to trade one share of Chevrolet stock for two shares of GM stock. He did this until he was able to take control of General Motors again. In 1917 Durant was president of General Motors again and Chevrolet was merged into GM, becoming a separate division. By 1920 Ford and Dodge were the only sales leaders above Chevrolet. 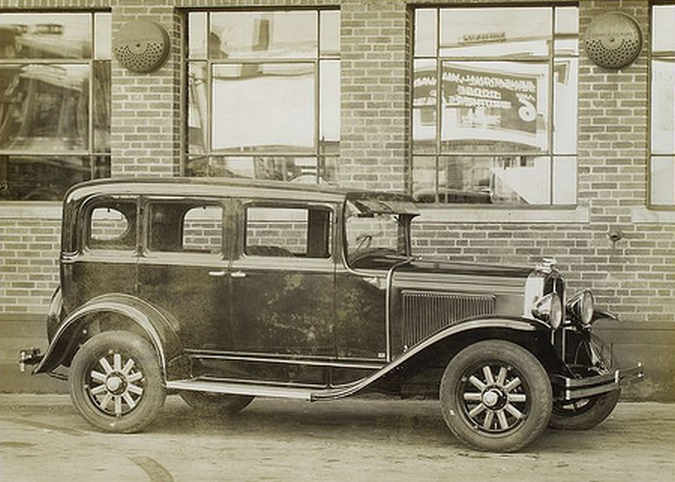 In 1925 the Chevrolet Superior, with disc wheels and “Duco cellulose finish” sold for only $650. This allowed for Chevrolet to outsell Ford for the first time. In 1929 1,328,605 1929 Chevrolets were produced and sold for $595. When it comes to antique automobiles, I am a GM fanatic, but Chevrolet is my preferred brand for my family car. Back in the seventies when I was dating my wife Victoria, we would go to Daytona Beach in my 1972 Chevy. I wish that teen would have been smart enough to take pictures. (Me not my wife.) That car is worth more now than it was when I owned it. 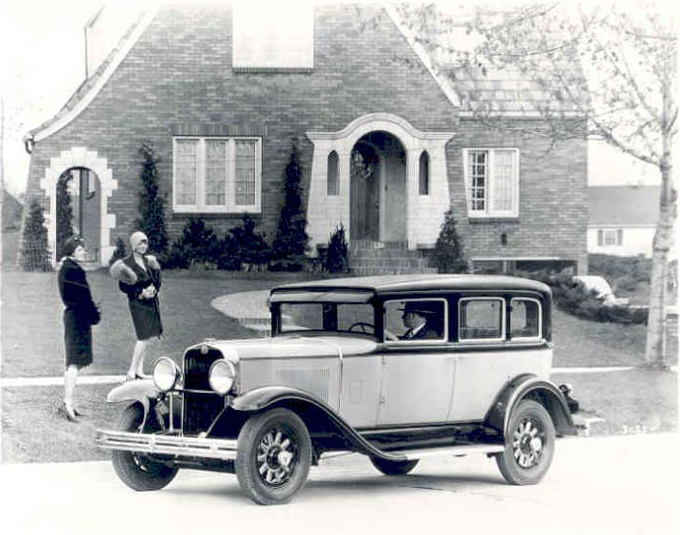 The car in the photo at the top is a 1929 Chevrolet taken with William Knudsen, President of Chevrolet. 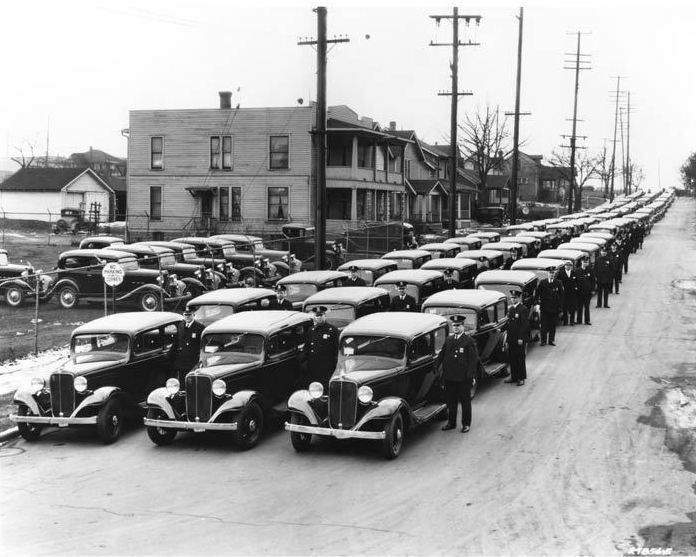 The photo below is the Detroit police department with the new fleet of 1933 Chevrolet police cars. 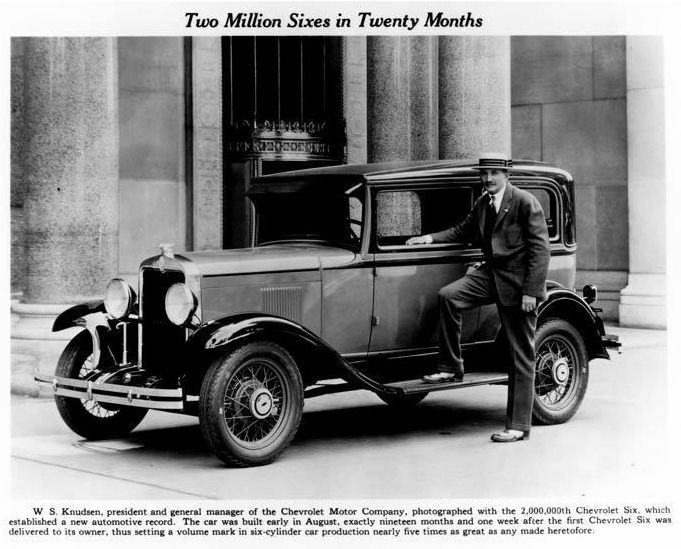 The photo on the bottom is a 1927 Chevrolet with President of General Motors, Alfred P. Sloan. I think one of the most significant impacts General Motors has made to the automobile industry was to change the way cars look every year. Only after creating a problem with dealerships by the timing of the changes, did they decide to change the vehicles in August, to give dealers a chance to move old body styles before the calendar year changed. The 1929 Pontiac had three changes for that model year. 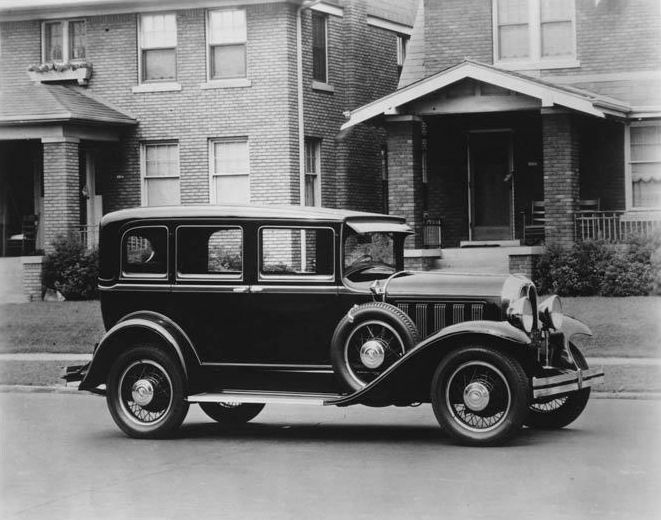 The first 1929 Pontiac model was introduced in August of 1928, the Model 6-28 which introduced new chassis and mechanical features, but used the 1928 body. The artillery wood wheels went from 12 spoke to a stronger 10-spoke design. The Marvel Carburetor replaced the Carter unit, and several other mechanical changes were made to the drive train. 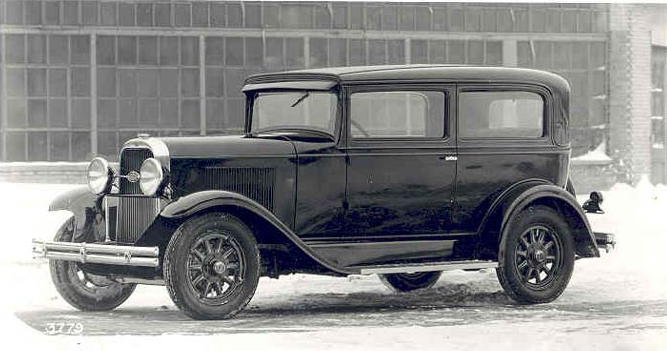 224,784 of the Model 6-28 were built before introducing the model 6-29A in November of 1928. This was a significant body change. The belt line now swept down at the point of the windshield. The radiator had a vertical chrome bar added down the middle of it, creating the trademark split grille design the company would become famous for. Adding horizontal louvers, which were changed back to the vertical vents after only a few months, emphasized the length of the hood. The rumor was that the horizontal vents were warping. Many car manufacturers used the horizontal vents during that time, so I don’t know if that rumor is true, or if it was some other reason that influenced the decision. The only change in the 1930 Model 6-29A was the Convertible Cabriolet, and Landaulet Sedan was now discontinued. The 1930 Model 6-30B, shown above, (There was not a Model 6-30A) saw body changes with the belt line that swept down at the windshield for the previous model, now contined to the front of the car. Life expectancy of an automobile in 1929 was 50,000 miles. Due partially to the bodies built with an armored wood frame construction, few examples have survived this early era of closed body production. GM used this method of construction until 1935. I will post examples of the wood frame of the 1929 Pontiac from my fisher Body manual.